The perfect afternoon snack with a cup of tea. Combine all ingredients in a bowl until well incorporated. The consistency should allow you to easily form balls, if not then add small amounts of powdered nut flour such as almond until you get a workable consistency. 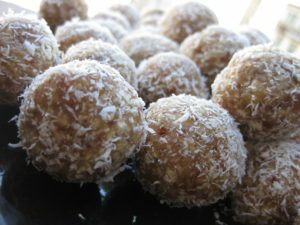 Roll about 1 tablespoon amounts between hands to form into balls. Store in an air tight container in the fridge. These balls also freeze really well. If you need nut free options – use a butter made from pumpkin and sunflower seeds instead.